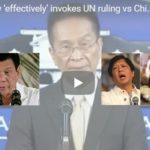 [VIDEO]: Bumuwelta ang Otso Diretso sa mga banat ni Pangulong Rodrigo Du30 sa mga kandidato ng oposisyon. Kumambiyo naman ang Palasyo at sinabing posibleng nagpapatawa lang ang pangulo. The senatorial candidates of the opposition Otso Diretso (Straight Eight) are going straight to hell, according to President Du30. The opposition coalition’s candidates have not done anything for the country but criticize. He made a comment about each one of them who are candidates as Senators for the 2019 election. Those people do nothing but criticize, Du30 said. He questions their competence and accomplishments for the first time in a campaign sortie. He calls former interior secretary Manuel Roxas II “hambugero” or arrogant. Roxas retaliates at once boasting his alleged call center achievement that the former President Gloria Macapagal Arroyo initiated. The former Senator is known for his incompetence in handling the Yolanda typhoon disaster as witnessed by many foreign journalists. To vote for Magdalo Rep. Gary Alejano is a “mistake,” the President said as he belittles the former soldier’s involvement in uprisings against Arroyo. “Look at the Magdalo. They launched a revolt in Makati… When the police came, they surrendered,” Du30 said. He also attacks Sen. Bam Aquino being just a lookalike of his uncle, the late senator Benigno Aquino Jr. The late Aquino was the rival of the late President Ferdinand Marcos who resorted to unbelievable strategies to topple Marcos. 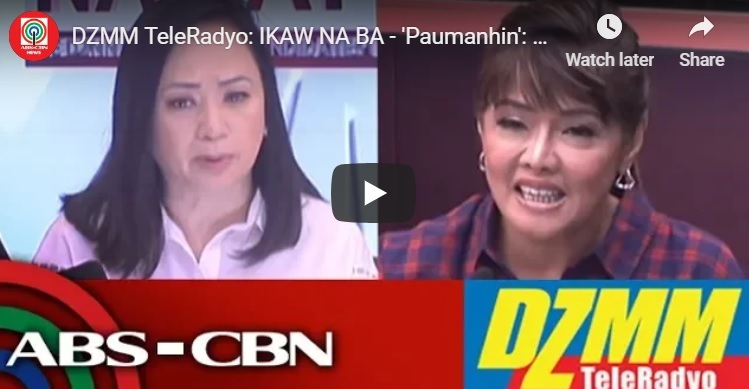 Robredo defends the opposition senatorial candidates. They were chosen because of their good track record, she said. The other Otso Diretso candidates hit back at Du30. They accuse him of using his position to campaign for his bets at the expense of the opposition. 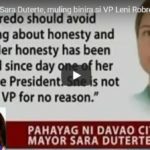 The temporary VP said that the fact that the President mentions each opposition bet shows that they are getting the attention of the people. On the other hand, Du30’s bet, Imee Marcos was the target of criticisms by the Otso Diretso team earlier. 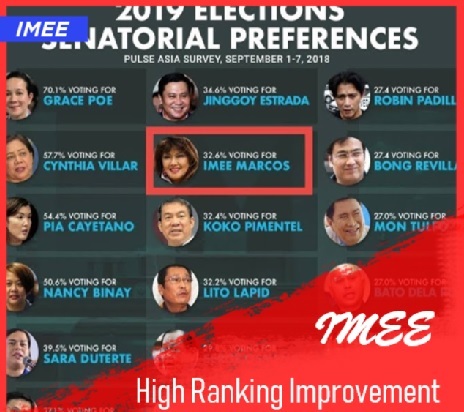 Who can Block Imee Marcos become the Top Senator in the 2019 Elections? According to Pulse Asia, the sudden rise of Ilocos Norte’s Governor in the recent senatorial survey is not due to “an increase of her voting support. The research firm’s president said that because of the percentage decline of the voting support for other prominent candidates like Senator Bam Aquino. “It’s not so much an increase of her voting support. It’s the decline in terms of the voting support for the others who were ahead of her in the past,” Pulse Asia President Ronnie Holmes said. “We saw a decline in terms of the pre-election support for the other candidates who were much more ahead of her in term of the ranking,” he added. 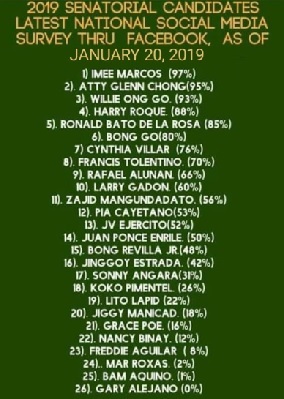 Among those slid down the list are incumbent Senators Aquilino Pimentel III, JV Ejercito, and Bam Aquino. Former senators Lito Lapid and Sergio Osmeña, as well as former Philippine National Police Chief Ronald Dela Rosa, follow the same fate. Marcos spends the last few months going around different provinces in the country. Her Facebook profile shows the various events she attends. Town fiestas to the distribution of relief goods are common agenda. Marcos also hosts her own radio show, “Imee Sagot” at dwIZ. I thank the public for their trust and confidence in me. My engagement with them paid off, she said. It is also noticeable that most of her supporters go out of the way in printing and posting tarpoulines endorsing her alongside Atty. Glenn Chong, the whistleblower of the 2016 frauds that put her brother, Bongbong Marcos into a better light in his electoral protest against the presumptive VP, Leni Robredo. 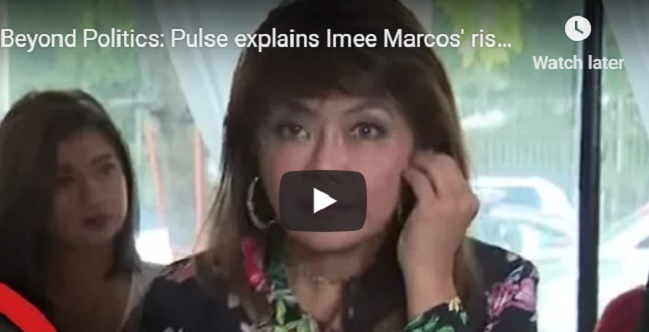 [VIDEO]: Ilocos Norte Governor Imee Marcos clarified on her previous remark to “move on” from the martial law issues thrown to her late father, the late President Ferdinand Marcos. Imee Marcos explains to Senator Aquino Aquino who presses the issue of the martial law apology that moving on does not mean forgetting the past. It is already in history and no one can change that. The best thing is to learn from it and make sure that it won’t happen again. The millennials are the youths who belong to the generation after the technological advancement. They have all the resources to hear both sides unlike before. 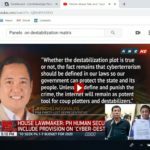 The Philippines, in particular, was in the control of the mainstream media. It influences the decision-making of the Filipinos during elections. The black media propaganda against the Marcoses is spread out through its networks worldwide. When the anchor asks if an apology must be done by Gov. Marcos, she replies that she has said sorry many times. Apologies to the victims and to others who were hurt because of the incident were undertaken on numerous occasions. However, she cannot apologize on any atrocities because the version that they knew when they were younger, was the opposite of the black media propaganda. Many older people are saying that the Marcos era was more prosperous and peaceful than any administrations after that. Gov. 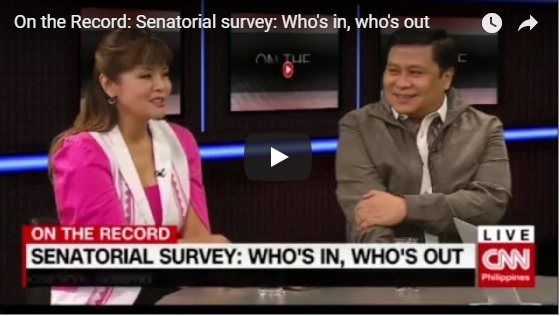 Marcos added that she is not in the position to accept the responsibility brought about by her father’s era. She can only move forward to work on how to improve the lives of Filipinos. Nevertheless, her political enemies especially the Aquinos, are again reviving this old wives’ tale. Marcos admits that their only mistake was staying quiet about the accusations to her deceased father. They just do not have the outlet to retaliate until social media arrives. This gives them the channel to air their side. 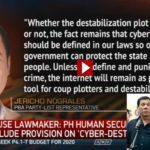 Better yet, real people who are witnesses of the said dark ages in the Philippine history also came forward through online platforms burying the half-truths propagated by the Aquino stalwarts. 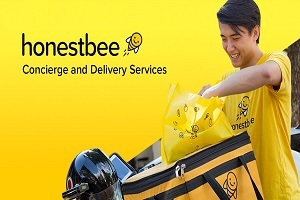 This is to the surprise of the yellow faction that went to the verge of befriending Facebook’s founder, Mark Zuckerberg. Like a real statesman, Bongbong Marcos supports the President on building closer ties with ASEAN member nations and China. On the other hand, sister Gov. Imee plans for the elderly and wishes to continue the pension welfare for the senior public servants. These happen as the country gears up for the 2019 election. It is observed however that the political tide has now switched in favor of the Marcoses in the most branches of the government. Gov. Imee Marcos said she wishes to continue the momentum of the Du30 administration’s ‘Build, Build, Build’ infrastructure program. The transportation and the improvement of telecommunication facilities in the country are some of the priorities. Secondly, she wishes to improve the prices of commodities. This is to soften the impact of the tax reform law on consumers and the global gasoline crises. Finally, Marcos plans to create jobs for women living in remote areas as well as provide a livelihood to elderly Filipinos who could still work. She also stresses to sustainably provide pensions to senior government retirees. These serve as her political platform for the upcoming election in 2019. The DND Public Information Office confirms that President Ferdinand E. Marcos is a Usaffe veteran.” Usaffe is short for US Armed Forces in the Far East, which was active from 1941 to 1946 and headed by Gen. Douglas MacArthur. The previous administration even honored a list of veterans with Marcos’ name on it. The late President’s love for the country drove him to provide benefits for public servants through GSIS. As a war veteran, his widow, the former first lady and now Congresswoman Imelda R. Marcos, receives old age pension from the Philippine Veterans Affairs Office despite the denial of his opponents. On the other hand, Bongbong Marcos explains the good in fostering an alliance with the ASEAN countries. The international agreements must not be sidelined because of a change of administration. As for President Rodrigo Du30’s perceived close ties with China, Marcos said it is good to see that the Philippines now has a better line of communication with the Asian superpower. On his State of the Nation Address (SONA) several days ago, the President mentioned maintaining an independent foreign policy. Marcos thinks that it’s about being a little less dependent on the United States. Marcos reiterates that the Philippines could benefit greatly from welcoming foreign investors interested in improving infrastructure, agriculture, large-scale engineering, and power development. However, this does not mean that the country will abandon its territorial claims, particularly against China. The great leaders’ ultimate achievement always boils down to providing for the welfare of the country and its people. The Marcoses have already mastered the art of sustaining the projects they initiated to last even after death – as per the case of the Marcos patriarch on the GSIS policies. This is the reason why they are the best top officials that can lead the country to greatness again.